Wonderful tour, our guide was knowledgeable and great. I’d have like more time and a little input into how we managed the day. We walked the grounds of San soucci - interesting, but my wife would have preferred 30 minutes shopping in town. Rest was great. A good day with a private driver and guide who gave exceptional service. The guide was knowledgable, we visited the Schloss Cecillienhof and Sanssouci plus old Potsdam. Full day customized to meet our interests. Guide Axel and the driver were knowledgeable, pleasant, and had everything under control. The walk across the Bridge of Spies was exciting as Axel included information about historic spy exchanges. 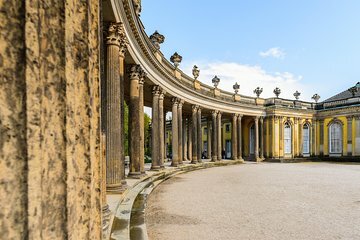 Sanssouci Palace is beautiful and absolutely worth the time. I wish we'd had a little more time in Potsdam's Dutch Quarter, but we were running late because we spent so much time walking around the grounds at Sanssouci. Even the drives in and out of Berlin en route were interesting as we learned about the history of the autobuan. So glad we did the tour!